Ladies and Gentleman, welcome to the Medici Family Circus. Where anything is possible and miracles happen. And now introducing their world famous flying elephant. 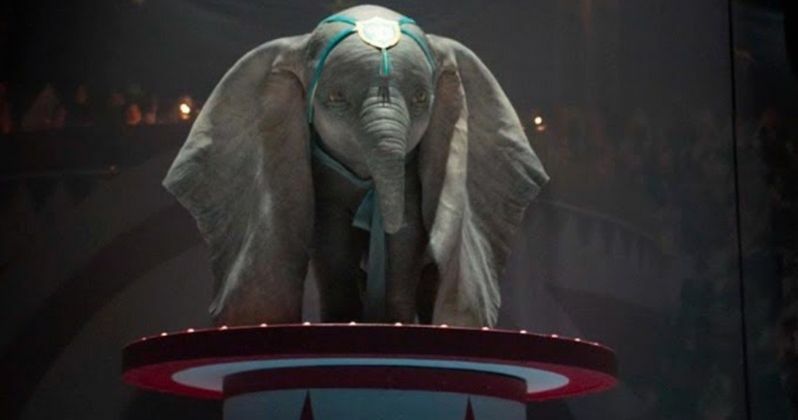 From the imagination of Tim Burton comes a live-action reimagining of Disney's classic animated adventure Dumbo. Just when you'd thought you've seen everything. On March 29, Dumbo will grab his feather and give you a show unlike anything you've ever seen. He will make you a child again. In Dumbo, the owner of a struggling circus enlists a man and his two children to care for a newborn elephant that can fly. Dumbo, whose oversized ears enable him to soar high, helps save this struggling sideshow, but when the circus plans a new venture, Dumbo and his friends discover dark secrets beneath its shiny veneer. Ehren Kruger wrote the screenplay based on the novel by Harold Pearl and Helen Aberson. Much like last year's Christopher Robin. Tim Burton is taking the classic Disney character and building a slightly new story around it. And it's sure to delight adults and children of all ages. Michael Keaton and Danny DeVito reteam with Tim Burton after they all collaborated on Batman Returns together in 1992. This is Danny DeVito's fourth time working with Tim Burton, having not only starred in Batman Returns, but also appearing in 1996's Mars Attacks and 2003's Big Fish. Danny Devito refers to Dumbo as the final chapter in his Tim Burton Circus trilogy. The movie marks Nico Parker's acting debut. Her mother is Thandie Newton, who was shooting another Disney movie Solo: A Star Wars Story on a nearby movie set. Eva Green is making her third appearance in a Tim Burton movie, having worked with the director on 2012's Dark Shadows and 2016's underseen Miss Peregrines Home for Peculiar Children. Like Danny DeVito, Michael Keaton is making his fourth appearance with Tim Burton, starring in the aforementioned Batman Returns, as well as the one that started it all, 1989's Batman and the classic 1988 horror comedy Beetlejuice. Many forget that Danny DeVito and Michael Keaton had worked together before Batman Returns, co-starring in the 1984 gangster comedy Johnny Dangerously. In that movie Keaton played the hero, and DeVito was the villain. This time around, they're switching roles. The two have a quite memorable scene in this latest footage. DeVito's Max Medici is trying to hide a monkey in his desk. But Michael Keaton's V. A. Vandevere catches on quickly. From Walt Disney Pictures comes a tale for all ages, in theaters this spring. Check out the latest preview along with some of the character posters that have been released over the past week.